I had a recent e-mail exchange with a young pilot who is just finishing up her commercial and is wondering about the next step in her quest to build time and find a job flying. She wanted to know if Africa was the next logical move. Her question made me realize that a lot of new pilots have probably contemplated the same idea so I thought I’d throw this post out as something of a public service. 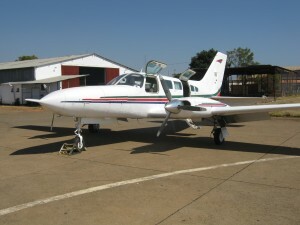 Cessna 402c I flew in East Africa. I spent the better part of 2009 flying a Cessna 402 in East Africa. The experience was, in a word, magnificent, and I wouldn’t trade it for anything. That said, the experience also remarkably challenging and it’s not a decision for the feint of heart. 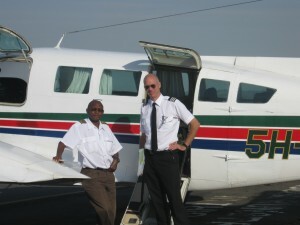 Yours truly at right, and at left, James, the Tanzanian pilot who was training me. James had more than 10,000 hours in his logbook. Africa, like northern Canada, is a pilot’s heaven: There’s an endless expanse of geography but very little in the way of infrastructure or roads, so the airplane is king. And because it’s out of the way, and because there’s so much flying, jobs for low-time pilots tend to be more plentiful than in more populated European or North American centers. Catch on with the right operator and you’ll build a lot of time quickly and have a tall tale or two to tell. That said, the events that unfold if you go — in terms of safety, lifestyle and job availability — will vary wildly depending on the country and region. I worked for a private company that had holdings throughout sub-Saharan Africa. They used the 402 to ferry their senior executives to their various plants and businesses. The airplane was based in Dar es Salaam, the largest city in Tanzania (about 2.5 million), on the coast of the Indian Ocean, and its maintenance base was at Wilson Airport, in Nairobi, Kenya. I deliberately targeted Tanzania for a flying job. Unlike, say, Kenya, it’s much easier to convert your licence there and get a work visa. That said, I needed a lot of help from my employer regarding the latter. Tanzania is also very safe for locals and westerners and it’s more or less politically stable. It’s massively corrupt, like most countries in Africa, but it’s stable. The time we went was at the height of the economic downturn and small airlines, afraid of what the impact was going to be on the tourist season, were very reluctant to hire. Generally speaking you won’t get a job in Tanzania with 250 hours and a newly minted commercial ticket. But you will have a very solid shot with 1,000 hours and multi-IFR rating. Generally speaking, I wouldn’t go with less than 500 hours. I went with 400 hours, multi-IFR, and struggled. But keep in mind those hour minimums slide depending on how robust the economy is and how much demand there is for pilots. Minimums also tend (or tended; the situation might have changed since I was there) to be lower in Botswana than Tanzania. They tend to be quite a bit higher in Kenya. Keep in mind that job availability and the willingness of a given country to grant a work visa will directly relate to how many home-grown pilots there are in that country. Each country, and each airline, is predisposed to hire its own citizens. So a country like South Africa would have very little interest in foreign pilots, just as, for instance, the U.S. would; by and large they have enough of their own pilots and immigration and work regulations will reflect this. When it comes to convert your licence, be prepared for pedantic, rule-obsessed bureaucrats who often see it their mission to obstruct, rather than aid, your quest to get licenced, Usually the firm you work for will help out and smooth the process. The flying is spectacular, the vistas as magnificent as you’d imagine. I was allowed to ride right seat in a Caravan on a trip into Ruaha National Park and won’t ever forget the baby elephant grazing at the side of the dirt strip or the two giraffes that bounded across the threshold as we taxied out for departure (I’m kicking myself to this day that I didn’t bring a camera on that trip). Trips to Nairobi for maintenance meant flying past Kilimanjaro, a sight I never tied of witnessing. But you won’t get much much IFR approach practice because nearly all the approaches are visual. Be prepared for being out of radio contact for long stretches. Often position reports will be made via relay from an aircraft flying higher than you (hence its reception distance is greater). Be prepared for very poor weather briefings and the thunder storms can be doozies. If you run into engine trouble, well, let’s just say that your odds of being found quickly are far, far lower than they would be in Canada or the U.S. or Europe. Air Traffic Control can be a bit of an issue. In South Africa ATC is of a North American or European standard; it’s excellent. Kenya, meaning Nairobi, is also good, and dependable. Everywhere else … well … keep your wits about you. I was cleared final once at Dar at the same time, place and altitude as a converging Cessna Caravan. The Caravan and I worked it out, but no thanks to ATC and there wasn’t so much as an incident report about it. I know of another pilot who was once cleared to an altitude below ground level. We — as in my wife and I — went to Africa with two young girls, then aged 1 and 3 (my wife — @tasneem_jamal — was working on a novel based in part in the region and needed to experience it). We never felt threatened, never felt unsafe. Quite the opposite. I’d suggest the same would be true in Malawi and Zambia. I had some iffy experiences in Kenya, however. Kenya is far more western, its infrastructure far more developed than Tanzania, but its police are not only corrupt, in some cases they’re dangerous. Police in Tanzania are corrupt, too, but they’re benign. Being white, and western, in the post-colonial political political scene that is Africa, more or less offers a layer of protection. That said, being white, and western, also makes you something of an economic target. Be prepared to be stopped by police on the road and asked for a bribe. It’s common, and the assumption is you have money. Usually, $10 or $20 later you were on your way. The alternative, which is cheaper, is to refuse but then be forced to spend the day at the police station. Be prepared to pay more for a taxi ride if you’re white than if you’re not (my wife is South Asian, and she did all the taxi cab flagging when we were there and saved us a lot of money). Generally there are two economies in most African countries. One for locals and one for westerners. The latter is, of course, hugely inflated mostly because westerners tend to work for big companies or NGOs that simply pay the going prices and accept it as the cost of doing business there. Our apartment in Dar es Salaam, Tanzania. We lived on the upper floor, in the unit to the right. We lived in a comfortable, modest, two-bedroom apartment with air conditioning, but paid $1,500 U.S. a month. Western, i.e., processed, food was incredibly expensive: $15 for a box of Special K cereal, $4 for a can of tuna. Locally grown fruit and vegetables, however, were incredibly cheap and the flavour far, far surpassed those you’d buy in Canada in February. 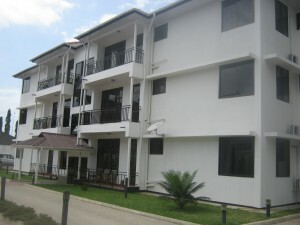 Some airlines, such as Coastal in Dar es Salaam, have subsidized housing for their pilots. No matter how nice your place, prepare to do battle with mosquitoes, bugs — the largest, most aggressive cockroaches you’ve ever seen — and rats. We actually had a rat take up residence in our car. This will sound funny but absolutely bring white pilot shirts and epaulettes, both first officer and captain stripes. You have no idea how much hassle they’ll save you when it comes time to go through security at airports. And the pervading culture is that, well, pilots dress like pilots, otherwise they’re not pilots. Some local hospitals in Dar were ok, but some were frankly, terrifying, and I don’t terrify easily. However good, western-style, care was available at the Aga Khan Hospital. But for complicated, serious problems, a flight to Nairobi was required. And for very serious issues, a flight to South Africa or even Europe would be your answer. Motorcycle — Indian made — I rode in Dar. My then-three-year-old is on the back. Goes without saying, but I’ll say it anyway: This as much of a ride as she was ever allowed. 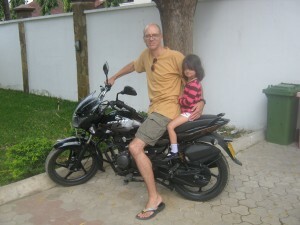 I bought a small motorcycle when I was there and used it to get to and from the airport. The roads and traffic are dreadful/dysfunctional in a way you cannot begin to comprehend until you’ve experienced it. Requires enormous patience. The roads are so filled with pot holes that a 4×4 is almost a necessity. Traffic is often so bad that vendors set up kiosks at the side of the road and do a brisk business from waiting cars. On the major routes, hawkers walk the line of cars selling everything: food, toys, flashlights, ironing boards, clothes, draperies, etc., etc. If you’re serious and interested in going, drop by PPRuNe.org and check out their Africa forum. There’s a ton of useful, up-to-date information and the pilots who are there are usually happy to share advice and tips. But remember to do a search first on your topic before you post a question, or cranky responses will unfold. I’ll put up another post soon about some of the flying/cultural experiences we had there. Any questions, feel free to contact. This entry was posted in Awesome places to visit, Heart-Stopping Stories, Tales of Cross-Country Adventure and tagged Africa, Dar es Salaam, Kenya, low-time pilot, Nairobi, Tanzania on January 30, 2013 by Craig Daniels.